Three hundred years ago England was very different from what it is today. The population was much smaller. Towns and cities were hardly bigger than villages. Most people never travelled far from their homes, so to go on a journey was quite an adventure. The roads were just rough tracks along which you walked. Only the wealthy could afford to go on horseback. Charles II was the king of England. He passed laws which said that no one was allowed to preach unless he had a licence from the government to do so. 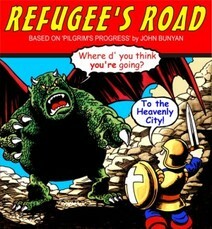 As a result of this many Christians were put in prison, one of whom was John Bunyan. While he was in prison John wrote one of the most famous books ever to be written in English. It is called Pilgrim's Progress, and tells the story of a man's journey from earth to heaven. Because of the old-fashioned language and long conversations most people today find it difficult to read. So here it is in a way that is easy to follow.